International marketing environment consists of global forces, such as economic, social, cultural, legal, and geographical and ecological forces, that affect international marketing decisions. International marketing environment for any marketer consists of internal, domestic, and global marketing forces affecting international marketing mix. 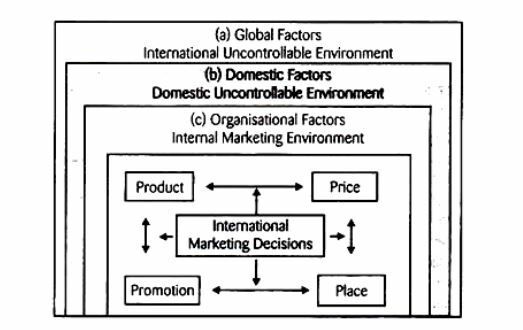 Global Factors (International Uncontrollable Environment), Domestic Factors (Domestic Uncontrollable Environment) and Organisational Factors (Internal Marketing Environment). For Ex: A manager who deals with international marketing has to design his marketing mix and marketing mix strategies in accordance with these forces. He also has to keep in mind about the impact of such forces on his marketing decisions and also the levels of opportunities and threats needs to be taken into consideration. People and businesses make decisions for resource allocation and prices for services and goods which are part of Microeconomics. The governmental regulations and tax policies are also taken into consideration. Microeconomics solely focuses on marketing environmental forces that determine the level of price, supply and demand in an economy. For e.g. microeconomic factors look into how a company would do to maximize the production and capacity in order to lower the prices of its products and to compete in the industry in better and efficient way. Macroeconomics, on the other hand, is the study of whole economy which includes the study of complete industry, not just of a specific company. This involves the phenomenon such as Gross National Product (GDP) and how changes in the economical factors such as national income, unemployment, growth rate and level of price affects it. For instance, the impact of net- exports on nation’s capital account or effect of unemployment rate on GDP. The macro and micro economics is considered as the study of two diverse divisions of economy. Whereas there are several issues that make them inter-dependent on each other. For instance, the price of end product would increase with the increase of inflation rate, the price of raw material will increase that will end up with increase in price of finished goods. The microeconomics adopts the bottom-up approach whereas macroeconomics has a top-down approach. Macroeconomic factors and microeconomic factors concurrently plays a vital role in establishing a successful business as it provides important means for professionals to operate the business in an efficient and effective way to generate sound revenue. Coming back to the topic, Global Factors are related to the world economy. Every aspect of marketing decision is also influenced by global factors. The main global factors include Micro and Macro Environment. The success of marketing strategy also depends on the customers of company’s product. The nature of customer such as b2c, b2b, international or local and the reason for buying the product will play a role in establishing the marketing strategy of company and how they approach the customers and serve them. The satisfaction of general public is a duty of organization. Company must take decisions while taking the perspective of general public into consideration and how they will get affected by their decision. The customers hold the power to make a win-win situation for a company by helping it reach the goals. Market competition exists when two or more firms sell same or similar products and services. The companies must take into account the way they approach the customers and sell their products to the customer, what price and product differentiation they have for their customer. These factors can be taken into account to get edge over their competitors. Business success depends on the suppliers when they enjoy an authority. The supplier of a company holds the power when they are the only one in the market or when they are the largest supplier of the goods. The buyer is not essential to the suppliers business, as the supplier’s good is the core ingredient of the finished product of buyer. The success of companies marketing strategy also depends on resellers if the finished goods of a company is taken to market by market intermediaries or any other third party. These forces include wholesaler, retailers etc. For example, If the retail seller holds a reputable name in the market then their reputation can impact the marketing of company’s product. Global relations among nations and degree of the worldwide peace, Geographic/ecological/climate-related factors, Functioning of international organisations like UNO, World Bank, WTO, etc., Availability of marketing facilities and functioning of international agencies, etc. Domestic Factors: These factors are related to the economy of the nation and it includes economic, social and cultural, demographic, political and legal, and other domestic aspects which constitute domestic environment for international marketing. This environment affects international marketing mix in several ways. Demographic forces do impact the different market segments, which includes region, country, age, educational level, ethnicity, lifestyle, cultural norms and values. The organization production and decision making process of customer also affected by the economic environment. The organisation must take into account the renewal of the natural resources of the earth such as agricultural product, forest, marine resources etc. The organizations production can also be affected by the non renewable resources which includes coal, oil mineral. The organization must consider the technological factors as the knowledge and skills used in production of goods. The technology and materials used in production of goods and services helps in smoothing the process of business. The organization should take into consideration the political and legal development relating to market and organization during decision-making process. The impact of organization’s services and products on the society must be taken into consideration. If there is any element used in production process or product that is harmful to society should be avoided since it is a social responsibility of an organization. An example is of the organizations and sectors those who have reviewed their services and products to be considered environment friendly. These are internal and controllable factors. They are related to internal situation of the company dealing with international trade. International marketer needs to use, adjust, and organize these factors to satisfy needs and wants of the (international) target markets. Objectives of company, Managerial philosophy of company, Personal factors related to management, Managerial attitudes toward other nations, customers, social welfare, etc., Company’s policies and rules, Resource ability of company and marketing mix, Form of organisation and organisational structure, Nature and types of employees, Internal relations with other departments and Company’s relations with other stakeholders and service providers. AI will advance more sophisticated attribution modeling, better audience targeting, better messaging, better creativity and experiences, customizing them according to time, location and event. AI will assist human expertise and talent with a scientific touch. IDC predicts that global spending on cognitive systems will reach $31.3 billion by 2019: China’s marketing community will lead the way. China’s internet economy has undergone a rapid expansion over the past decade. From humble beginnings as an imitator, China has taken a dramatic leap to become a trailblazer in digital marketing. In 2018, Chinese innovation and imagination in marketing will increasingly benefit from Chinas’ sophisticated digital ecosystem that combines data, technology, and content to enable better customer insight and new opportunities. Strategic marketers must take into consideration the micro-economic factors and macro-economic factors during decision-making process as these forces have a major effect on the marketing campaigns success. Thus marketing environment forces can play a vital role in the success of a business, its marketing strategies, marketing campaigns and its branding.